The opioid epidemic isn’t only impacting humans but is now killing working dogs, vulnerable to ultra-potent opioids entering the illegal drug trade. Drs. Maureen McMichael, professor of veterinary clinical medicine, and Stephen Juriga (IL DVM ’87), veterinary dentist, are working together to make resources available to protect working dogs from the opioid crisis. Dr. Maureen McMichael—head of the emergency and critical care service at the Veterinary Teaching Hospital—has been teaching canine first aid to law enforcement officials for years since her arrival at the University of Illinois. In 2016, Drs. 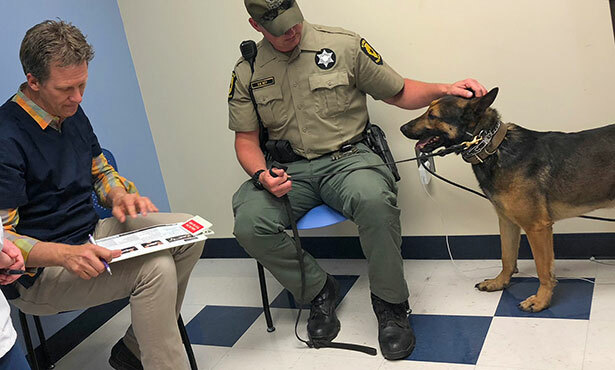 McMichael and Ashley Mitek, teaching assistant professor of veterinary clinical medicine, started their campaign to educate K9 handlers and first responders in opioid overdose reversal. The two created a training video for canine handlers in March 2018. Our goal is to train handlers to perform an oral examination and identify oral pathology, primarily tooth trauma, common in working dogs. This training needs to start when these dogs are brought into service and continue on a daily schedule throughout their career. Dr. McMichael has since published an educational website called WorkingDogHQ. Her site shares information on canine CPR, instructions on administration of the opioid reversal drug naloxone, and most recently an oral health initiative led by Illinois alumnus, Dr. Stephen Juriga. Dr. Juriga has been providing dental care to working dogs from the Chicagoland and northern Indiana region for the past 12 years. Dr. Juriga got involved with this project after he attended Dr. McMichael’s lecture on CPR and the prevention of opioid overdose at the 2017 Fall Conference for Veterinarians. He spoke with her after the lecture, offering to promote oral health materials for working dogs on Dr. McMichael’s national platform. “Restoring and maintaining oral health has a positive impact on a pet’s or working dog’s overall health, comfort, and function,” says Dr. Juriga. 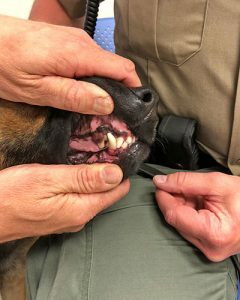 Dax, one of the K9 officers examined by Dr. Juriga at the May training session had a recent fracture of his canine tooth. The tooth needed a root canal and crown to protect the tooth and prevent infection. Dr. Juriga has designed three tools for handlers to improve K9 oral health care. An oral exam reference guide that illustrates normal anatomy as well as common dental diseases of working dogs, an oral exam checklist designed to provide a dental chart for the working dog’s veterinarian, and a self-study PowerPoint with examples of common oral pathology and strategies for handlers to maintain their dog’s oral health. K9 handlers can print and laminate free guides for practical use in the field. Reversing opioid exposure is the first step, but Drs. McMichael and Juriga continue to increase awareness by educating working dog handlers and sharing tools and information. Dr. McMichael is also keeping tabs on legislation changes that affect working dogs. In 2017 Illinois enacted legislation allowing ambulance services to transport injured police dogs to veterinary clinics, as long as there were not people in need of care. Since 2017, at least three states have adopted this law, and Dr. McMichael is confident it will spread. WorkingDogHQ is updated as legislative improvements for working dogs are enacted so K9 handlers can gather a variety of information relevant to them.